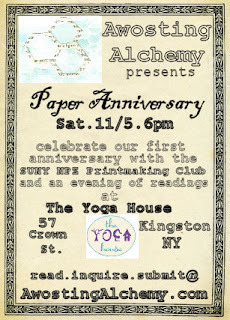 I'm reading this Saturday night in Kingston at the Awosting Alchemy Paper Anniversary party! 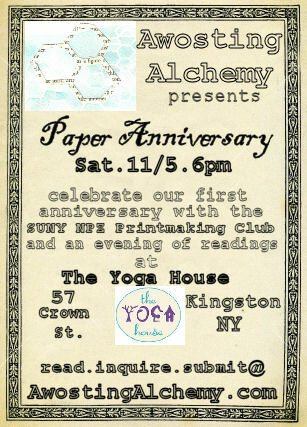 It's at the Yoga House, 57B Crown Street, uptown Kingston. You should probably go. In addition to readings, art will be on display by the SUNY New Paltz Printmaking Club, and they'll be unveiling their next issue's cover art. All of this while barefoot! C'mon, it'll be great. Come at 6pm. I was invited to do a reading at New Paltz's 5th Annual Celebration Of The Arts Festival on Huguenot Street, and said yes, of course. This means that I got to read inside of an ancient and beautiful stone church, right next to the historic Huguenot cemetary, at the top of the preacher's pulpit, next to an exquisite harpsichord. A pretty perfect spot with pretty poor lighting. Can't win 'em all! Chris Brandon Whitaker curated the readings this year. I hosted a home/d.i.y. silkscreening workshop for the Hudson Galaxy Gazette last month! In it, I did an overview of the basics, from buying a screen to learning about different methods of screening, and how to decide which method is best for which project. I geared the workshop towards learning how to turn your living space into a fairly functional silkscreening studio without spending a bunch of money, which involved sharing tips of building your own hinge table to help with precise registration, where to find a power washer, how to use the sun to expose your screen's emulsion, etc. I demonstrated with printing up some HGG logo shirts, and then had attendees dream up their own designs, and screen them! I've been hosting monthly mixtape trades for the Hudson Galaxy Gazette, too! The next one is on the 9th, so make a tape (or a CD) for it, okay? Speaking of the Gazette, go check out the November calendar! It's full of good stuff, including a pumpkin potluck and show, a karaoke night, an elder care workshop, TWO fermentation workshops, an art show, a reading, a cob-oven building workshop, and more! Go check out the online calendar at http://www.hudsongalaxygazette.com, and look for a hard copy calendar (featuring artwork by Terrah Bretherton!) around the Hudson Valley! Check out the news section while you're there to see pictures of some cool things you may have missed! 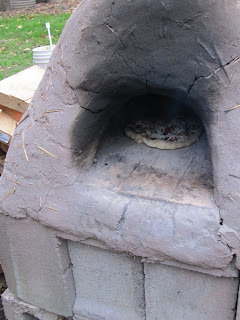 I attended a backyard-beer-brewing workshop and cob-oven pizza-making party last month, too! 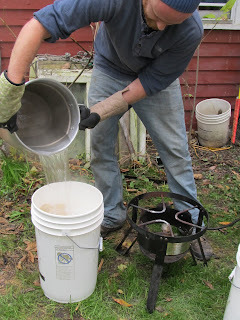 Justin, home-brewing master, showed us how to brew beer in 5 gallon batches at home, and Magen fired up her cob oven and was making pizzas all day! It was pretty dreamy. 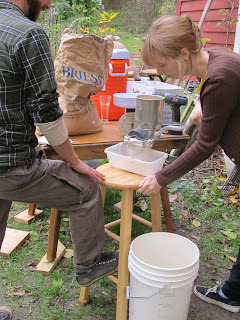 The beer was made from scratch, which meant hand-grinding the grains, and Magen made the pizza dough from scratch, too! I went up to Syracuse and recorded piano and flute tracks on my friend Sara Cilantro's new album! It's going to be out sooner or later, and I can't wait to hear the whole thing finished up. It already sounds pretty damn incredible. It's coming out on Plan-it-X Records, be on the look out! 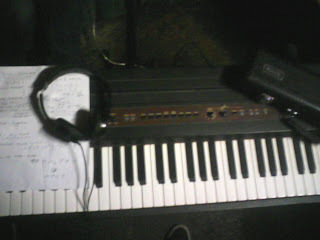 Here's a really junky cell phone picture of the piano, headphones, my notes, and my flute case! My housemate Nick and I have undertaken a new hobby as of late, searching for and collecting crystals. As thoughts of crystals started to consume my every moment, and I found myself doing it to de-stress, I dreamed up a design for T-shirts and tote bags and pretty much anything wear-able, to help express what I really wish to be doing at all times. Using the tired "I'd rather be..." device, I spent a night silkscreening "I'd rather be CRYSTAL HUNTING" shirts for my housemates. Now everyone knows how I feel all the time! Perfect. The only thing: don't wear it WHILE you're crystal hunting. Then it's just sort of redundant and confusing. If you want one, just let me know. BRAWL (Broads Regional Arm Wrestling League), everyone's favorite Hudson Valley charitable society of tough-as-nails lady arm wrestlers, had a bout at Water Street Market in New Paltz last month! If you're un-acquainted with BRAWL, consider getting with the times and attend the next match, but for the meanwhile, do some research! The photos/videos/articles you will uncover will be the funnest. I have wrestled a few times before as "The Librarian," but this time I was in the entourage of the honorable Dr. Moxie. 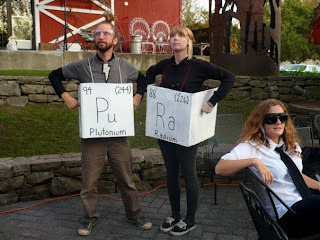 Given her mad scientist identity, Nick and I fashioned entourage costumes of two very radioactive elements of the periodic table: Radium and Plutonium. In the night, a hefty amount of money was raised for the Ulster County Crime Victims Assistance Services, who offer assistance in all forms to victims of assault and abuse in Ulster County. For Halloween, I was Marge Simpson. I copped out and bought a large blue wig, but did a little bit of work and sloppily sewed a green tube dress from an XL shirt I thrifted, and spray painted a white necklace red. 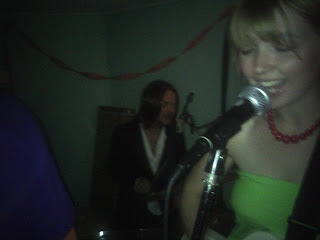 My friend Dean put together a Halloween cover show in a New Paltz basement, and I played keyboard with him and some other folks for The Cure. Matt, Amanda, and I also had gotten a Foo Fighters cover set together for the occasion, with Amanda playing bass, Matt on drums, and me playing guitar. We all sang. It was a really great time. Weezer, Hall and Oates, and Slime Boyz played as well! Halloween is my favorite thing ever. 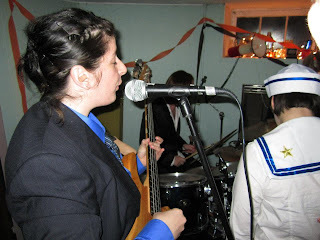 My deep deep love for cover bands probably factors into that pretty heavily.